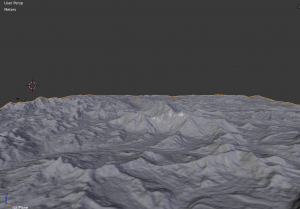 This Geovisualization project developed a working 3D model of the Sagarmatha region using graphics and animation software, Blender, culminating in a fly-through of the region outlining all mountains above 8,000m. 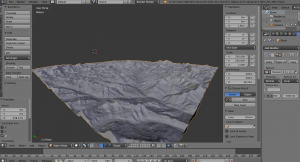 The purpose of this blog is to detail the steps needed to develop a 3D model of any desired region around the world, using Blender, and is therefore not limited to this one example. 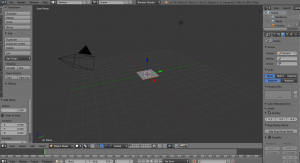 Blender is a free open-source graphics and animation program that has many uses beyond what was explored in this project. Many of their open film projects can be seen on their website at https://www.blender.org/features/projects/. 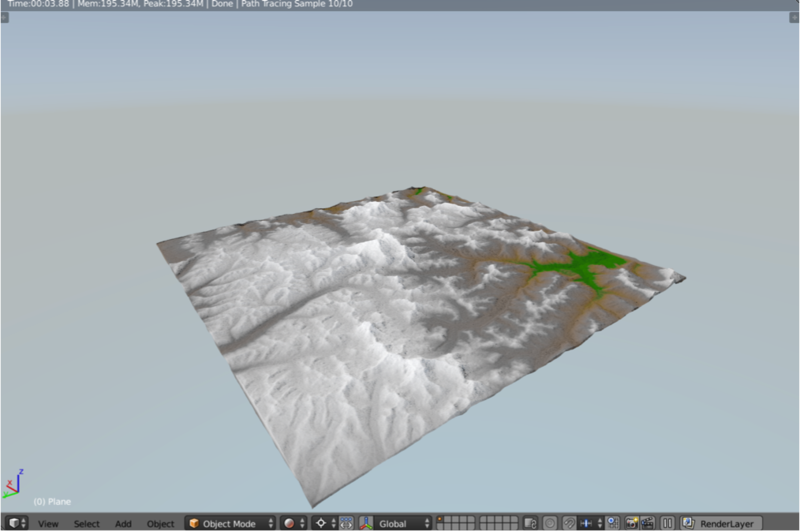 Since this program has incredible diversity in its applications and can create photorealistic imagery, I chose it to produce a 3D mapped mountain environment of the Everest region in Nepal, combining both graphic design and geospatial data. It should be noted that this entire project was done in Blender Cycles (a version of Blender). 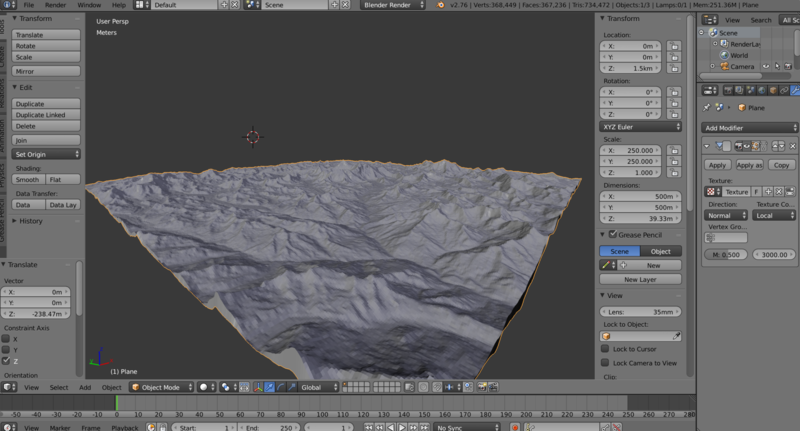 Process and develop a fly-through of the desired mountains. The first step involved extracting digital elevation model (DEM) data from the US Geological Survey website, using http://earthexplorer.usgs.gov/ to define the region of interest. Using a simple search for Mount Everest on Earth Explorer, the region was pulled up. Once the region was located, multiple points were used to help define the regions of interest for data acquisition. Once the region was selected, ASTER DEM data was pulled for all four Lat/Long regions identified by Earth Explorer. After downloading the DEM data, it was uploaded into QGIS to merge and crop the four DEM layers to develop the zone of interest. 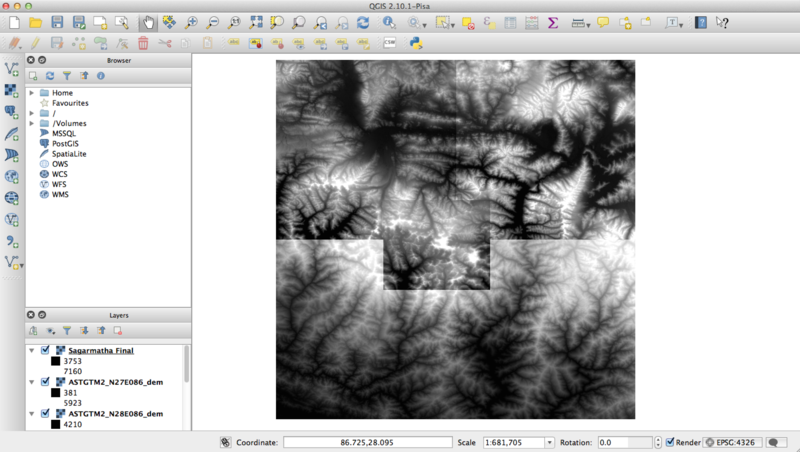 Raster –> Miscellaneous –> Merge was used in order to combine the underlying four DEM layers into one crop-able sheet. Next, a Raster Clipper tool was used to select the desired region from the merged DEM layer as shown below. 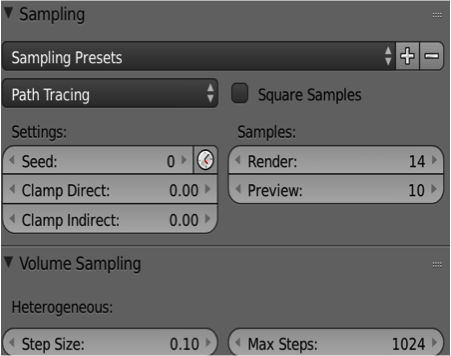 This clipped section was saved as a TIFF file to be imported into Blender. The first step involved deleting the cube by pressing X and then clicking “delete”. Next, it was necessary to bring in a blank plane to display the geospatial data. This was done by using the shortcut, Shift-A, and then selecting under Mesh –> Plane. This produced a blank plane in the centre of the grid, where the cube was located. The next step was to subdivide the plan into multiple grids. This was done in the Edit Mode by hitting tab and then scrolling down in the Transform sidebar to Subdivide. Subdivide breaks the plane down into as many smaller planes as desired, however the more subdivisions there are, the more information and challenge it is for your computer to handle the detail. For the purpose of this assignment and the limitations of my computer, 500 subdivisions were made to the plane creating over 250,000 squares and 370,000 vertices. Once the plane was subdivided, the plane was scaled up to a more appropriate size. In order to make it easier to scale up, units were given to the plane by going to the Scene tab and changing the units to “Metric”. In the Transform sidebar, the plane was scaled up to 500 by 500 meters. Although this is not the actual scale of the DEM region we are looking at, it provide enough size and detail to appropriately map the desired region. After the plane as set up and given an appropriate scale, it was necessary to import the geospatial data onto this plane. This was done by going to the Modifier tab and then selecting a “Displace” modifier from the pull-down menu. Click “New Texture”, and then under Type select “Image or Movie”. Under image, select the TIFF file saved earlier. 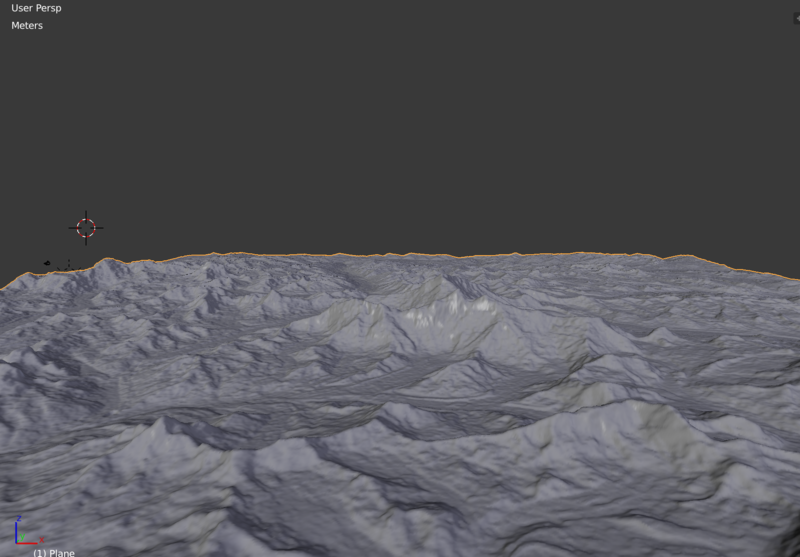 The next step was adding texture to this terrain to give it some realistic definition and colouring. 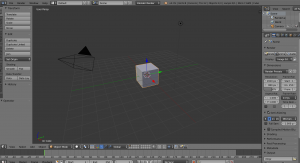 There are multiple methods for texturing in Blender. One step explored in this project was the use of a colour ramp based on vertical height. This was all done in the Node Editor and involved multiple nodes. This first node was a Texture Coordinate, which tells Blender what object the colours will apply to. In this case “Generated” was selected, as it would automatically generate the colours on the desired object. Next a Separate XYZ node was used to separate the desired Z-axis to create a vertical layering of the selected colours. After separating the Z-axis, a Mapping node was added to help further identify the locations of the colours on the object, specifying the Z-axis under Texture. 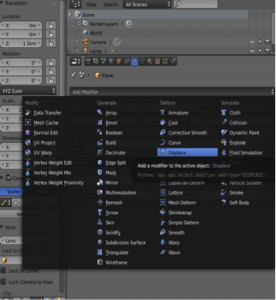 Next a Gradient Texture was used alongside a ColorRamp node to develop the desired colour ranges for the 3D plane. Colours were chosen based on personal examination of the mapped region, going from a dark green and brown for low-lying forests to white for snow-capped peaks. This is all part of a Diffuse BSDF, which is a tool that creates the material for the desired plane. The resulting rendered image shows how the colour ramp looks on the 3D plane. The second last thing to add prior to creating the fly-through was the sky texture, which was done by simply going to the World tab and under Surface and selecting “Background” –> “Sky Texture”. The intensity of the Sun and location can be altered using the provided Vector and Colour mapping options. For this project, Ambient Occlusion was turned on as it added more realism to the lighting of the 3D plane. Once the map was ready, I added camera animations to fly-through the mountains. This was done by first creating a path for the camera to rest on. Once again, this was accessed by pressing Shift-A, going to Curve, and selecting “Path” at the bottom. The desired path can then be scaled and shaped by moving the XYZ vector points of the line. 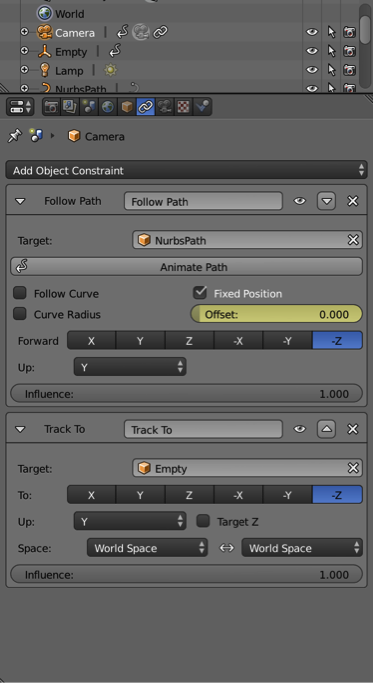 Once this path was adjusted to the appropriate location, I added a Follow Path object constraint to the camera under the Constraints tab. After adding the constraint, change Forward direction to “–Z”, and Up to “Y”. In addition to fixing the camera’s orientation, I defined the position on the path by pressing “I” on Offset at “0.000”. Next, I went to Video Sequence view and moved the current frame to the desired end frame (in this case 1600) and then changed the Offset value to “1.000” and once again pressed “I”. This sets the end of the path of the camera at the end frame, 1600. 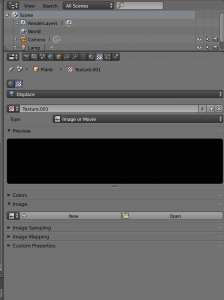 Next it was necessary to add an Empty object that the camera can track throughout the animation. Once again, Shift-A was used to select “Empty” and then “Plain Axis”. 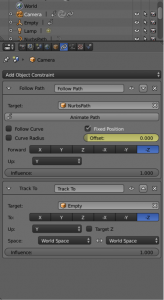 Another object constraint needed to be added to the camera, this time a Track To constraint, which used the same Forward as “–Z” and Up as “Y”. The camera should now be on the path created and pointed at the plain axis. This plain axis could be positioned at any desired region on the map. 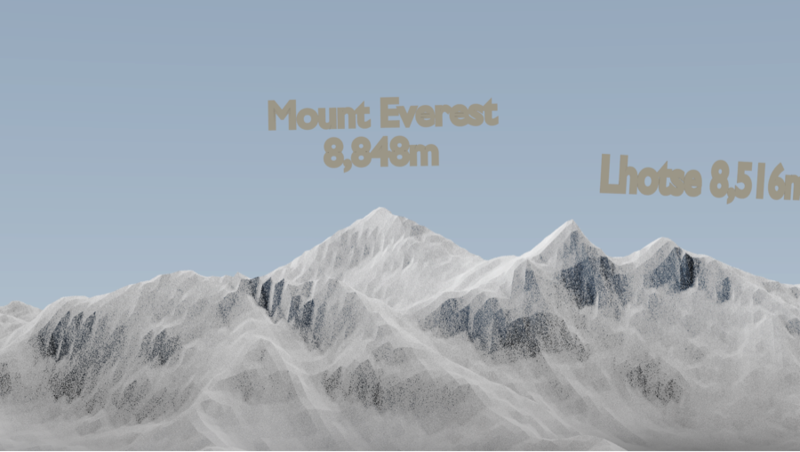 For this project I put this plain axis near the peak of the first mountain and moved it throughout the animation. For each movement, the plain axis was selected at a desired frame by pressing “R” and selecting “Location”. The object was then moved to the second mountain and the frame was adjusted to approximately 200 frames later. Once again, the plain axis was selected by pressing “R” and selecting “Location”. 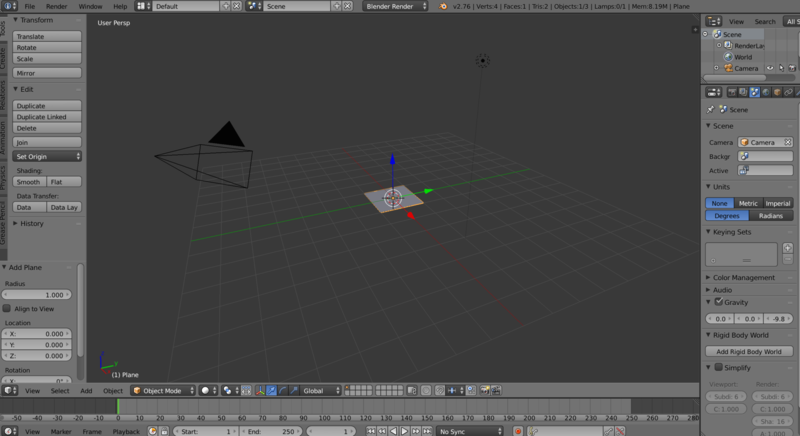 This identified that the camera needed to move to the new location of the plain axis, giving it 200 frames to do so. This process was done twice more to capture the remaining mountains. At this point it was possible to animate the camera fly-through. 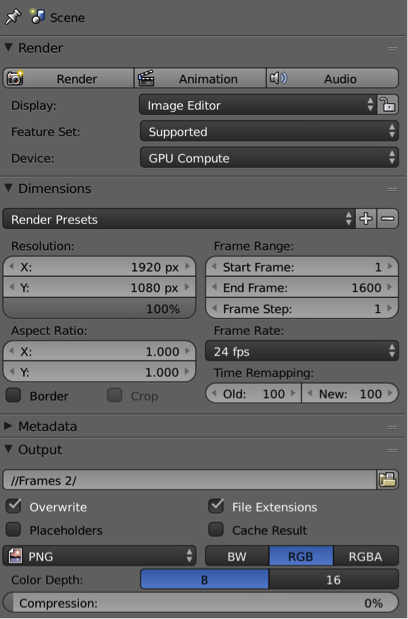 In order to do so, a few minor things needed to be done in the Render Tab, including defining the desired resolution (1080p in this example), setting the Start and End Frame to 1 and 1600 respectively, making the Frame Rate 24 frames per second, and choosing an output type. The project was first rendered as pictures or .png files because if the render process crashed, you would be able to continue rendering from the individual picture frame it crashed at. In addition, under Sampling, the samples were increased to help reduce any picture noise caused by light scattering. 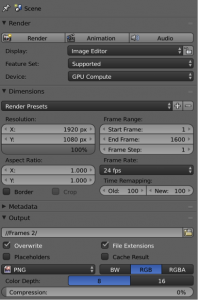 “Render Animation” was then clicked after all the settings were finalized. 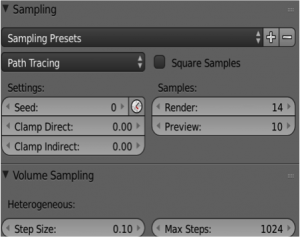 The rendering process varies in length and depends on the number of samples, detail of the images, and number of frames. For this project, the render took around 4 hours. 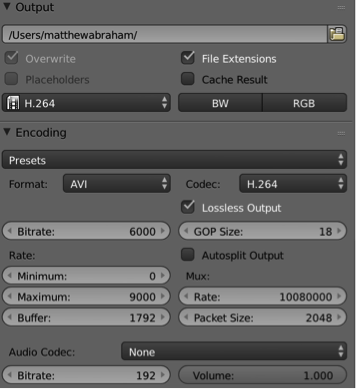 After the rendering process was complete it produced 1600 individual pictures, which were loaded into Blender’s Video Sequence Editor by locating the folder the render output was saved in and selecting all the image frames. 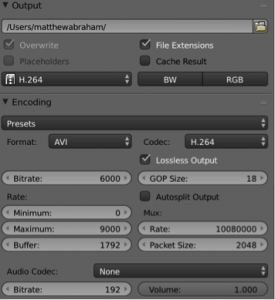 Once uploaded into the Video Sequence Editor, the output type was changed from a .png image to an h.264 file, which is a video output. “Lossless Output” was also selected, and is found under Encoding. Lossless Output ensures that there is no compression in the photos between the original frame and the new video output. This produced the video file of the entire project. 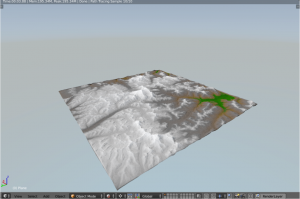 This example demonstrated how to create a 3D model of the Sagarmatha region in Nepal and create a detailed fly-through of the region using the graphics and animation program Blender. This same process can be applied to anywhere in the world with DEM data.